So here we are, we are at 200 posts amazing hey? I've been doing this for so many years too it's a little overwhelming but hopefully i'll see another few more years and maybe 200 more posts! So to mark this landmark event in my calendar I've done this, the first official film that got me into horror. I was 8 or 9 years old and my older friend had this on a fuzzy old copied VHS. I didn't know what I was getting into but i'm glad I did get into it. I would also find out many years later that this was Peter Jackson's first feature length film too. This is the thing that helped him launch wingnut films and go strength to strength with each subsequent film, one of his next films was the ultra violent puppet show parody Meet the Feebles. Another one I love. There are so many things I love about this film and so many things that make me wince too. Not only that there's visible mistakes too, these don't matter one bit though they only add to the films charm. With a tiny, tiny budget the film did some spectacular effects with it's cash too, from alien costumes to rocket launcher explosions. Because the film is more a tongue in cheek gore fest rather than a genuinely scary film I think eased me into the genre nicely. The film starts with an empty town, the town of Kaihoro and some specialists sent in from the fictional forces of AIDS (yeah I know right?) which stands for the Astro Investigation Defence Service. The team of four bumbling guys comprise of Derek (Jackson), Frank, Ozzy and Barry who are trying to deduce the whereabouts of the towns population. Some of the others are attacked and kill some blue shirted aliens, Derek captures himself what he believes to be an alien to. It could be his bearded brother (mainly because ever including Jackson plays at least 2 or three other people/alien) this alien is called Robert. Derek tortures him to try to learn what the aliens are up to, unknown to him Roberts screams are attracting the surrounding aliens to his aid. Derek bravely dispatches these reinforcements, accidentally leaving the torture knife in Roberts foot, when our nerdy hero turns from killing the drones he quickly realised Robert has escaped. In some good cutting and camera angles he fights himself, Derek is unfortunately seemingly knocked to his death from a cliff top. A fake or seemingly fake charity collector is attacked by Robert next, though he does manage to escape to a large house. Thinking he's safe he's unfortunately knocked on the main alien hordes door he is knocked out and dragged indoors. Down from the cliff top Derek awakes, his head seemingly saved catastrophic damage by hitting and killing a seagull in it's nest. unfortunately it's not saved him enough as a flap drops open on the back of his head and some of his brains fall out. Derek after convulsing crams his brains back in and stops the flap up with a hat. The other guys manage to infiltrate the aliens house and after tearing off an aliens head Frank wears the blue shirt to mingle in with the other aliens. Robert is commended for taking out Derek and is given the pleasure of serving his vomit in a bowl to the masses. Frank after eating some (and enjoying it) finds out the towns populace has been packed up as a new source of fast food for these aliens and about the trapped charity worker. After getting back to the others Frank explains the aliens plans and they plan to save the charity guy once the aliens have gone to sleep. They attempt to but are attacked by the aliens who get alerted, a stray shot knocks off Dereks hat and he loses a chunk of brain by stepping on it. He quickly rescues the rest and uses his belt now to keep his head together grabbing a chainsaw he goes on a rampage in the aliens house saving some of the others in the process. He even uses some of the aliens brains to replace his lost chunk too. 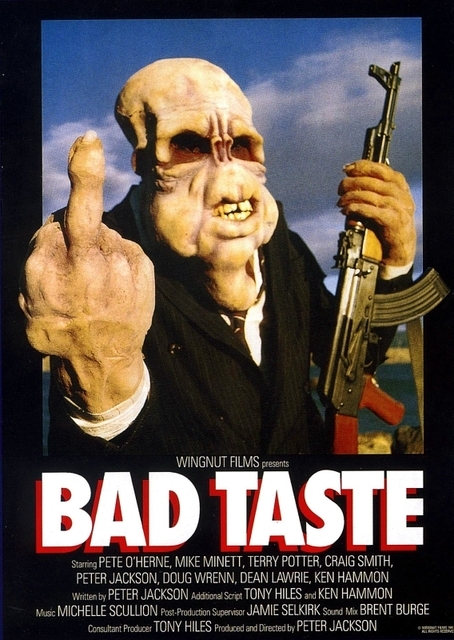 So that's as far as i'll spoil this delightfully strange, gruesome yet incredibly fun film, THN awards Bad Taste the highest 5 out of 5 stars.